Glen Park gardening in San Francisco has been an adventure. I moved from Sunnyvale, where it was quite sunny, flat, but with cool nights. 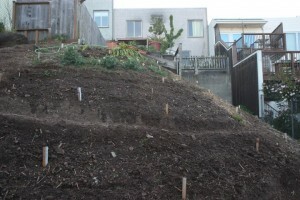 The garden now is on a steep rounded hillside, facing South East, with about half of the hillside facing East. 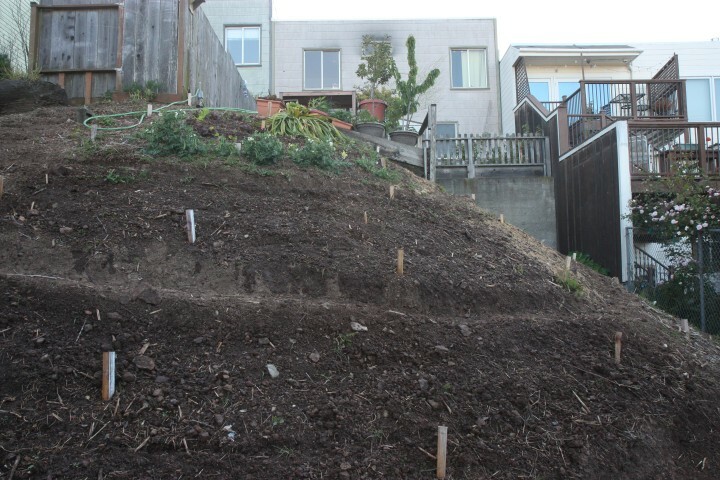 The soil is rocky clay, and I will be documenting the process of building retaining walls so it’s easier to walk up and down the hill to the garden. It’s driving me mad that I don’t even have a compost pile yet! When I moved to San Francisco, I wanted to have a garden, but it was also important to be near the freeways and BART. So the steep garden was a compromise, but workable. I’ve been growing things in containers and cleared the hillside of huge amounts of wild fennel, and planted some lettuce, peas, and strawberries just for the year. Surprisingly, things have grown quite well, and I’m learning about the Glen Park micro-climate by tracking the weather and soil temperature throughout the year. The book “Golden Gate Gardening” provided a lot of garden inspiration along with my own experience. I decided to create a list of vegetables and fruit that records both my successful and unsuccessful attempts to grow certain plants in our neighborhood. It seems that there is a lack of web-enabled data for good varieties to grow in San Francisco, so I hope this can help someone else as they start their own food garden.